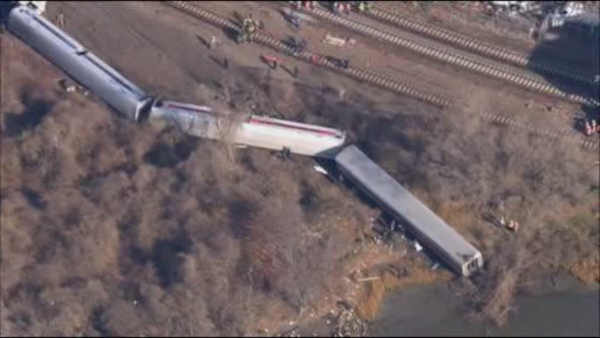 NEW YORK -- An engineer who fell asleep at the controls of a speeding train in New York City, causing a derailment that killed four people, will receive a lifetime disability pension from the commuter railroad that employed him, a published report said. The Journal News reported Friday that William Rockefeller will receive $3,200 a month for life from Metro-North Railroad. Rockefeller was at the controls of a Metro-North train that derailed in the Bronx in December 2013, killing four passengers and injuring dozens. Prosecutors said Rockefeller fell asleep at the controls but declined to prosecute him. The Journal News said officials cited medical privacy issues in refusing to discuss Rockefeller's disability. In September, Rockefeller's union said he was seeking the disability for a post-traumatic stress disorder brought on by the accident on Dec. 1, 2013. The Metro-North pension is in addition to Rockefeller's federal railroad retirement pension. The amount of that pension has not been disclosed. Rockefeller has filed a $10 million federal lawsuit against Metro-North. He claims the commuter railroad was to blame for the accident. The ruling on Rockefeller's pension came from the Pension Disability Medical Review Board of the Metropolitan Transportation Authority. "The Pension Disability Medical Review Board reviewed the appeal and determined that Mr. Rockefeller is disabled from performing his function as an engineer and he is eligible now to receive his pension," the MTA said. Rockefeller's attorney, Ira Maurer, declined to comment on the pension award.